The first week of the Kansas high school football season featured several marquee games matching ranked teams. In all, ten teams ranked in our Kpreps Top 5 poll lost in week one. How did that shake this up? Here’s a look at the week two rankings. 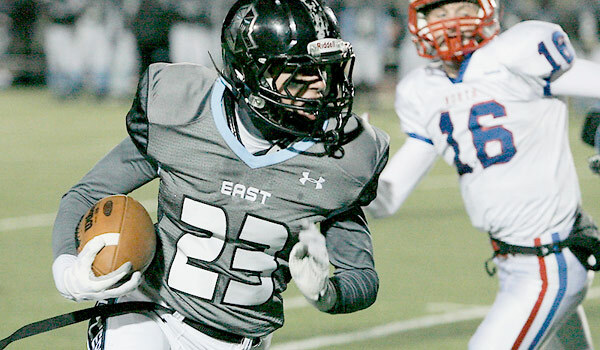 In analyzing Class 6A for our preseason poll, the votes were essentially split between Olathe North and Shawnee Mission East for the top spot. Both teams were victorious on Friday night; however, they each won in different fashions. Shawnee Mission East dominated Gardner-Edgerton 40-0, while Olathe North took advantage of a late fumble by Rogers-Heritage (Ark.) to escape with an 18-13 win. Trailing 13-12, the Olathe North turned the ball over on downs with under two minutes remaining and was out of timeouts before Heritage lost a fumble while trying to run out the clock. More concerning for Olathe North is that starting quarterback Cole Murphy left the game with an injury in the first half and did not return. Matthew Wright stepped in to rush and pass for a touchdown before he two was injured and left the game in the fourth quarter. As a result, The Lancers have overtaken the Eagles for the top spot in our 6A poll. Blue Valley remains at No. 3 in the poll followed by Topeka High and Lawrence Free State. The Firebirds enter the rankings thanks to defending champion Derby’s second-straight season opening loss. Bishop Carroll looked every bit like the favorite in Class 5A by dominating an experienced Wichita Northwest team, 43-14. Wichita Heights remains in the No. 2 spot after shutting out Wichita Southeast 35-0, while the Blue Valley West Jaguars flexed their muscle on Thursday night with a 37-13 win over Lawrence. Maize, ranked fourth in Class 5A, broke a 13-13 tie with a late touchdown to knock off a 6A-ranked team in Derby. Kapaun Mt. Carmel rounds out the 5A poll after defeating Wichita East, 35-18. In Class 4A Division I, Bishop Miege outlasted Blue Valley Northwest 51-36 to stay atop the poll. The Stags trailed 14-7 early before reeling off 30 straight points to grab control. Topeka Hayden was impressive in a 56-7 rout of rival Topeka Seaman. The Wildcats racked up nearly 450 yards of total offense in the win. Third-ranked Hays had to rally behind quarterback Alex Delton to win at 6A Olathe Northwest, 12-10. KC Piper moves up a spot to No. 4 after edging Lansing, 20-14, and Ulysses enters the poll at No. 5 after blasting Liberal 38-6. Andale remains on top of 4A Division II with a 41-20 win over defending 4A champions Buhler. The Indians rushed for more than 360 yards on the night. The Columbus Titans are the new No. 2 team in the poll after an impressive 25-14 win at former SEK League rival Chanute. Holton drops just one spot to No. 3 after losing 18-7 at 3A No. 1 Silver Lake. The inexperienced Wildcats struggled on offense in rushing for just 120 yards or less than one-third of their average per game from a season ago. Holcomb and Wamego round out the poll at No. 4 and No. 5, respectively. Silver Lake is typically thought of as an offensive-minded team, but it was the Eagle defense that shined in their 18-7 win over 4A power Holton. The Eagles held Holton to just 120 yards rushing and came up with just enough offense to produce a win in the showdown of two of the state’s top programs. Rossville remains ranked second after beating Clay Center, while Conway Springs and Scott City follow after posting impressive first week wins. The first ranked team to fall during the 2014 season was Galena, which lost 16-12 to St. Mary’s Colgan on Thursday night. Wichita Collegiate replaces the Bulldogs in the 3A poll at No. 5 after beating Rose Hill, 28-6. In the showdown of ranked teams in Class 2-1A, La Crosse knocked off Olpe 28-8. The Leopards racked up more than 450 yards of total offense and held Olpe to just a kickoff return for a touchdown. La Crosse remains ranked No.1 , while Olpe falls just one spot to No. 4. Phillipsburg is the new No. 2 team after shutting out Thomas More Prep, 48-0. Oakley moves up one spot to No. 3 after a 14-10 win over Colby, and Meade enters the poll at No. 5 after blasting Leoti-Wichita County 64-12. There’s a new No. 1 in 8-Man, Division I as Brandon Davis scored on a 26-yard touchdown run with :40 seconds remaining to propel Spearville to an upset of top-ranked Madison. As a result, the Lancers move up one spot to No. 4 in this week’s poll, while Madison checks in at No. 5. Hanover takes over the top spot after a 52-12 win over Axtell. Defending champion Osborne moves up to No. 2 and Central Plains is up one spot to No. 3. Both the Bulldogs and Oilers picked up key wins over ranked 8-Man, Division II teams last week. Osborne will face the top-ranked team in Division II for a second consecutive week when they battle Beloit St. John’s-Tipton on Friday. The Blujays move up to No. 1 from No. 3 this week after beating Hill City 68-22. Last week’s No. 1 Thunder Ridge fell 52-28 to Osborne and drops to No. 3 this week. Chetopa is now ranked second after scoring 44 first-quarter points in a 56-0 shutout of Marmaton Valley. The Victoria Knights fall from No. 2 to No. 4 in this week’s poll after losing 42-24 at Central Plains. Last year’s Division II runners-up Sharon Springs-Wallace County enters the poll at No. 5 after beating Atwood-Rawlins County, 24-12. The Wildcats replace South Barber, which lost 48-32 to Pratt-Skyline.